The EMA oral appliance from Myerson increases airway space by advancing the mandible using interchangeable elastic straps. EMA elastic straps come in 9 different lengths and 4 different strengths. The shorter the EMA elastic strap, the farther the mandible is advanced. 36 different straps allow for the most effective repositioning with maximum comfort for the patient. How does the EMA work? ​The EMA Oral Appliance from Myerson works by opening the bite and gently advancing the mandible with interchangeable elastic straps to increase airway space. This custom made oral appliance is only available through medical and dental professionals. ​The EMA is made from a proprietary thermoplastic polymer that delivers superior impact strength to acrylic at a lower cost than polycarbonate. 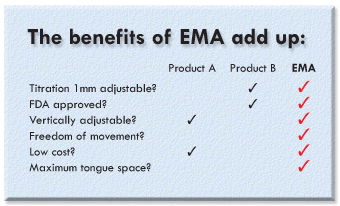 EMA Oral Appliance is vacuum formed. To see the video please check our YouTube channel. 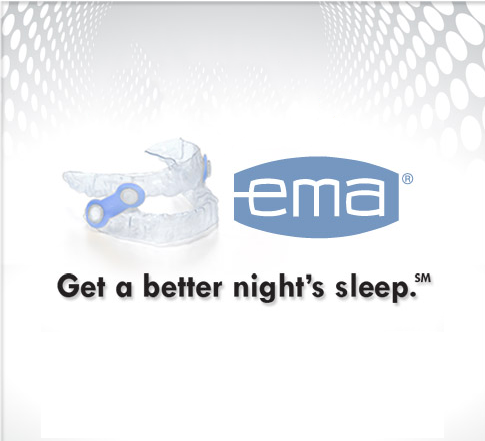 ​With proper care, the EMA custom lab-fabricated appliance will effectively treat OSA for years. Can I make it myself? ​​EMA is only available through Myerson’s authorized network of dental laboratories. For a complete listing of Authorized EMA labs, please click on the “Find an EMA lab” tab located on this page. Where do I get the EMA First Step kits? How do we become an Authorized EMA Lab? ​Myerson has a certification process that EMA authorized labs undergo to ensure high quality of fabricated oral appliances. If you wish to become an authorized EMA lab, please contact Myerson at 800-423-2683.